Have some extra time on your hands? Looking for projects you can do today (or this weekend) to be better prepared? Well, look no further. 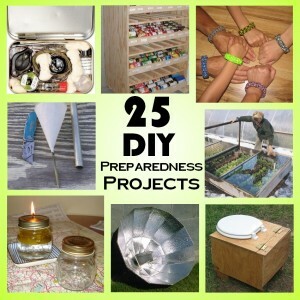 Here are 25 great weekend preparedness projects I’ve gathered up from around the web. 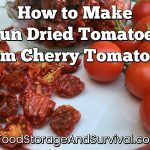 Great for the prepper, survivalist, or anyone wanting to be a little more prepared at the end of the day. Each of these projects are fairly low budget (some only require your time and a piece of paper) and shouldn’t take longer than a couple of days to complete–many won’t take more than a couple of hours. Tackle one (or more) this weekend and you’re that much more prepared than you were yesterday! 1. Make a rocket stove with empty cans. You might need to have soup for lunch to get enough cans for this. 2. Build a Solar cooker–The link has lots of different designs you could try–some even using those shiny vehicle windshield shades. If you’ve got some extra time and a sunny day, try cooking something in your new cooker! 3. Make your own homemade survival bars. Perfect for stocking your emergency kits! 4. Make some dryer lint fire starters. 5. Build a heater out of a candle and some terra cotta pots. 6. Make a candle from a tub of Crisco. 7. Make an oil lamp. 8. Not enough light for you? Okay, make a torch! Just like in the movies! 9. Build a PVC bow. 10. Make a blow dart gun. 11. Take a trip to a shooting range. If you don’t have a gun of your own, some ranges have them to rent. Take a friend or your spouse if you can and do some shooting. 12. Build a shooting bench. Downloadable plans at the link. 13. Build a space saving can rotator rack: or this one that’s a little more finished looking (read: takes longer) with downloadable plans. You could also make a larger standing unit if you’re really crafty with wood and tools. 14. Add some “earthquake proofing” to your food storage shelving. See this post at Prepared LDS Family for some great ideas and be sure to scroll down into the comment section as well. 15. Get in your food storage room and do an inventory or some organizing. 16. Build a cold frame for winter gardening. 17. Plant a container garden. If you have a warm, sunny room, you can grow some vegetables all year long even in cold climates. 18. If it’s warm enough where you live, get outside and plant something. 19. Make a paracord survival bracelet. 20. Protect your electronics with your own homemade metal trash can faraday cage. Check the video at the previous link and click here for some instructions on how to make one (scroll WAY down the page to get to the pictures). 21. Try picking a padlock with a soda can. 22. Put together an important documents binder. Here is a starter list of documents you’ll want to include. 23. Put together a survival kit in an altoids tin. There are many variations on this type of kit. You can do a google search to get ideas of what people are putting in theirs, or head over to Field and Stream for a starting point. Have a little more time and money? Put together a full 72 hour emergency kit for yourself or your family. 24. Write down your evacuation plan including what you’re taking, where you’re going, and a meetup plan in case someone isn’t home at the time you need to leave. Include any other family members that may be affected. I like having a 10 minute list and then an additional items list if you have a little more time before you have to get out of your house. If you’re feeling really ambitious, run a mock evacuation drill with your family! 25. Build your very own composting toilet. With only one bathroom in our house I’ve seriously considered this numerous times–maybe this weekend is the one I set out building one of these! I’m sure I didn’t cover everything, so what are some of your favorite weekend prepper projects or activities? Maybe you have something you’ve done or would like to do. Share in the comments, and feel free to link to instructions! These are some great suggestions to help people get prepared. I especially like making your own homemade survival bars. I’m looking forward to giving it a try. is there anyway one can make survivals using meat rather than sweet stuff? You can make pemican. Google how too. I haven’t tried it yet, but am planning to soon. Stores for quite a while at room temperature also, so it is perfect for prepping. Are really good too. Our local butcher makes these and I have had them sitting in an open jar for over a month in the Summer and they were just as good after 30 days, just a bit drier. Awesome list Angela. I’m posting a link to this post on my prepping article at Squidoo. These ideas will help a lot of people get more engaged with preparedness. We don’t like to think about it, but I loved the article on Composting Toilet Plans because frankly, it’s something we could actually need. Thanks for all the great ideas. I will probably try to build one of those rocket stoves. Something else I really want to try is to build a wood gasifier. It probably would be a little longer than a weekend to make but it would be very useful as well. Thanks for the great article. Did you ever get around to making a gassifier? I’ve been searching for/printing lots of different plans for them but don’t know which one is best. I was hoping to get some advice from someone who has tried it. I have not made one. There are quite a few people with videos on youtube showing the ones they have made and how they work. One of those could be really handy to have! Wow I never knew you could can dry beans. WoW!!! So what is the shelf life of canned mean and those beans? I know you can add soda to aleve the gas but does it effect the process time? New to your blog and I can see that it has a ton of ideas I can use to get ready here in Florida. Thanks. I really like this post. There are so many smaller projects we can work on. Thanks! Great ideas! I look forward to trying some of these with my children. Thanks! Great round up! Thanks for the inspiration. With the rocket stove-if u cut the flanges in the number ten can only through the side of the can, leaving the rim intact, u significantly increase the structural support of the stove and make it less likely that a tab will crumple to spill a full pot of boiling water on your toes. A box of CRAYOLA brand crayons makes EXCELLENT candles. Snip off the tip down to the paper and light the paper (paper is the wick). Each regular candle burns about 20 minutes and it consumes the entire candle. No big mess. I stock up when school supplies are cheap in August. 50cents per box is pretty cheap. Haven’t timed any JUMBO crayons yet. Just make sure to get CRAYOLA brand (do NOT use Rose ARt- they blob all over everything!) I use a clothespin at the bottom to hold the crayon up. I have seen a lot of information on using a fresnal screen out of a rear-projection TV to start a fire. A much better idea: no one uses the old “overhead projectors” anymore. There is a mini fresnal screen just under the top glass plate of the projectors. It’s a pliable plastic screen that looks like it has circles engrained in it. When placed in the suns rays just right, it will “Magnify” the sun’s rays into a pin point and it’s so hot that it will start the wood smoldering within 1/2 a minute. This should only be used by an ADULT! It can be dangerous. This lights a fire wtihin a matter of seconds of you use cardboard and/or paper. Contact almost any school and you’ll find an abundance of never used overhead projectors! I got 5 for free when a school was disposing of all the “antiquated” machines! Very good list of suggestions. Thank you for the inspiration.